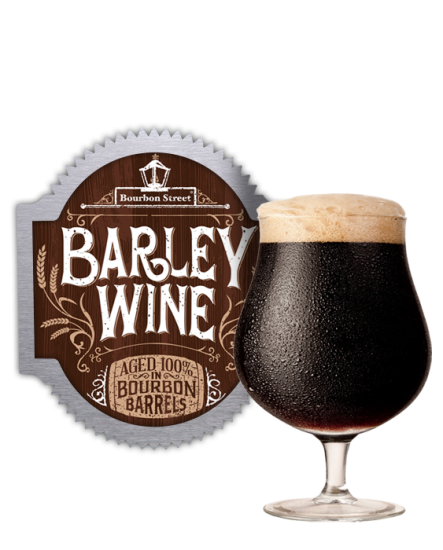 Bourbon Street Barleywine is a strong ale that is aged in small batch bourbon barrels. It is brewed with pale and light caramel malts. The pale and caramel malts give the beer its sweet taste and deep red color. After fermentation the beer is cold aged for 4 months. This is typical of the style and will allow the flavors of the malt and hops to balance and produce a very smooth flavor. After cold aging, the beer is transferred into the bourbon barrels. It is then aged for another 8 weeks to absorb all of the flavors from the barrels. The result is a strong ale that balances the deep sweetness of the malt with the warming and toasted flavors of the bourbon barrels.